The Embassy Suites Irvine - Orange County Airport, the premiere all-suite hotel located in Southern California has just finished complete property renovation on April, 2016. 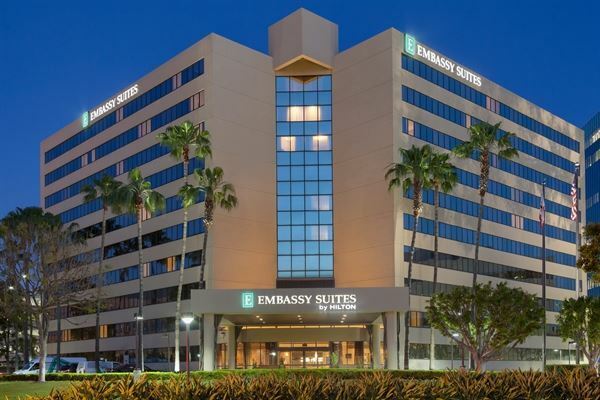 Less than a mile from John Wayne/Orange County Airport, this Embassy Suites hotel is centrally located to major tourist attractions such as Disneyland Park, Anaheim Convention Center, Knott's Berry Farm and also shopping at South Coast Plaza and the Irvine Spectrum are just minutes away. The hotel features 293 guest rooms with great amenities including separate living room, private bedroom, microwave, refrigerator,dining/work area, high-speed internet access, complimentary airport shuttle service, complimentary cooked-to-order breakfast, air conditioning, TV-Cable, flexible work environment and more. Additional amenities include wireless internet, onsite restaurant serving lunch and dinner, fitness center, business center, indoor pool, whirlpool, onsite full service Starbucks, and many more. The Embassy Suites Irvine is ideally suited to host intimate receptions, meetings and other corporate events. The facility provides meeting rooms with concierge services, audio visual equipment, secretarial service, photo copying service and printer. The largest meeting room provides 990 square feet area for a bigger event. Our two Executive boardrooms make the perfect space for small meetings with 10 to 12 attendees. Each room includes 50-inch, wall mounted LCD monitors. To make planning easier, look into our Meetings Simplified bundled packages. Atmosphere/Decor: Enjoy our outside terrace, perfect for rehearsal dinner, cocktail parties, and small dinners. Regionally inspired small and share plates modernizing the Mexican tradition. Book your next social event at Embassy Suites Irvine - Orange County Airport. The Ambassador Room is a flexible space for up to 70 people. It's perfect for social events, retreats, gatherings. It has a large spacious foyer with direct access to our skylit atrium. Food and beverage packages are available. Guests are within easy reach of many California attractions, including the Disneyland® Resort, University of California-Irvine, and the Anaheim Convention Center.